Disinfection of the incubator without eggs or chicks in it. In order to neutralize the smell of formaldehyde inside rooms after fumigation we can spray with 10% ammonia aqueous solution. Author eggincubatoreuPosted on 22 October 2016 22 October 2016 Categories Incubation and HatchingLeave a comment on Formaldehyde Fumigation. When and How. The Le Mans chicken is a breed which was developed in the 1600’s near the town of Le Mans, in the Sarthe region of France. For centuries, the Le Mans was a popular meat breed, primarily sold as capons. It was common in France until World War II, when its popularity decreased with the introduction of more commercially viable meat breeds. Incubation Problems due to Breeders’ Microbial & Fungal Infections. Embryo Mortality after day 15th of incubation. Mortality of embryos immediately after eggshell piping. Infection is transmitted inside the breeder hen by close contact of the infected air sacs of the breeder bird with the follicles of its ovary. Mycoplasma infection is transmitted to the yolk shack of the egg thus the embryo is infected. Additional spreading of the disease happens inside incubators and chick transport boxes. We find a foamy yellowish exudate inside the thoracic air sacks of the embryo. This post mortem examination should be performed to at least 20 samples and repeated three times for three consecutive incubation cycles. The veterinarian must always correlate these findings to possible clinical signs of the disease on the breeding flock. Some fertile eggs are not developed at all. Another part of the batch of these embryos dies during incubation and hatching time. Some embryos stay alive and become carriers of the disease. The gonads of the breeders (ovary and testicles) are infected. The infected hens lay infected eggs. A healthy hen may even give infected eggs if it is mated by an infected rooster. The percentage of infected eggs may be between 1-50%. Some of the eggs examined do not have developed blastoderm. Dead embryos. If the embryos do not die they infect healthy chicks of the same batch. Paratyphoid is a breeders’ food borne disease. The flock is infected by consuming feed contaminated by S. Typhimurium. Then it transmits the microbe by the feces. The egg is infected when passing through the cloaca. Thus S. Typhimurium is already present on the egg shells. Salmonella Typhimurium find its way through the pores of the egg shell during the first week of incubation. Infected chicks that survive infect the healthy ones by the hatcher dust and egg shell contact. Another way of spreading of the disease is by chick sexing procedure, transfer boxes and brooding spaces. Regular microbiological examination of the breeder feed. Dead embryos. If the embryos do not die they infect healthy chicks of the same batch. 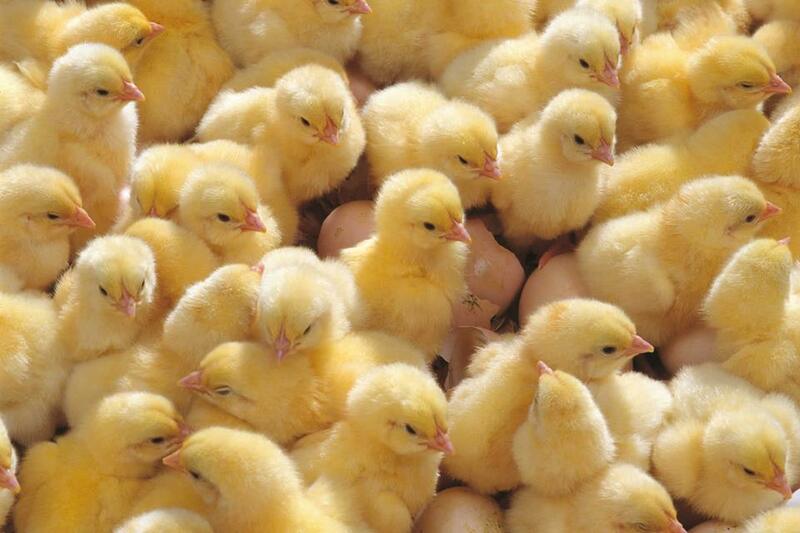 The chicks that survive usually develop omphalitis (yolk sack infection). If Staphylococcus Aureus is complicated the chick dies at the first 3 days after hatching. If Streptococcus Faecalis is complicated the chicks die by septicemia at the age of 10-20 days. Pathogenic strains of Escherichia coli infect the intestine of the breeders. Then the uterus is infected through hen’s cloaca from which the eggs are infected. Inside the hatchers the infection of the chick’s lungs and air sacks is air borne. Some embryos die during incubation. Most of them Survive. The eggs are contaminated from the environment of by the nest material. Washed eggs or eggs dipped in antibiotic solutions are more susceptible to infection by Aspergillus Fumigatus. The infection is done through the pores of their eggshell. Inside the hatchers the infection is transmitted by air. Sometimes we can detect Aspergillosis by candling of the eggs. The Aspergillosis infection lesions are present inside the egg’s air cell. Careful disinfection of the incubators and the eggs before placement. Disinfection of the hatchers. Regular cleaning of the nests. Author eggincubatoreuPosted on 19 September 2016 19 September 2016 Categories Incubation and HatchingLeave a comment on Incubation Problems due to Breeders’ Microbial & Fungal Infections.